According to a summary provided by the American Immigration Lawyers Association (AILA), the effects of the ban differ according to the visa category. The affected countries discussed below include Chad, Iran, Iraq, Libya, North Korea, Somalia, Syria, Yemen. For non-immigrant visas from the affected countries, the executive order issued on January 27, 2017 immediately suspended issuance of all non-immigrant visas until further notice. Applicants were advised not to schedule any visa appointments or pay any visa fees. They would not be allowed to board any airplane flying to the USA or enter at any land port of entry. The only exception were diplomatic visas. Also dual nationals from any country would not be affected by the restriction. The executive order did not clarify how non-immigrant visa holders who were already in the USA would be treated but according to AILA the language of the executive order is broad enough to include them. However, the issuance of a visa, which is considered an “admission” should not be confused with status. So the revocation does not revoke the individuals’ legal status. 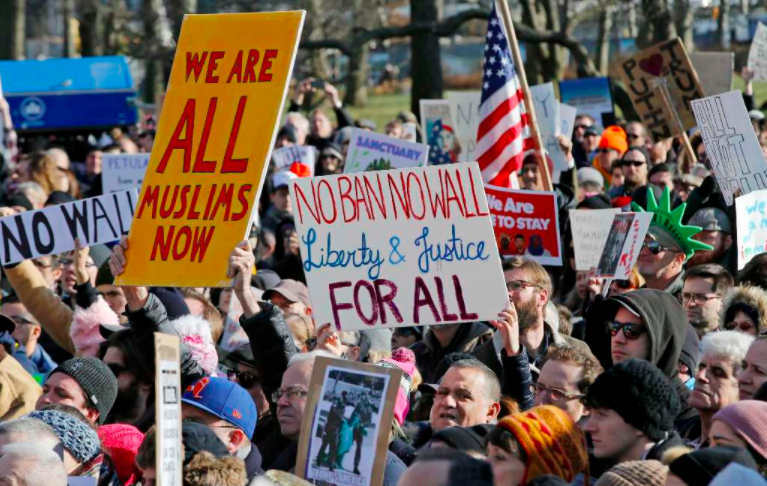 Trump’s travel ban suspended for 90 days the issuance of all immigrant visas from the seven affected countries, including those with dual citizenship. The National Visa Center stated it would continue processing cases up to the point of the interview, but would not set any interview appointments. However, individuals who were already granted permanent residency would not be impacted by the travel ban. But according to Customs and Border Patrol (CBP) people are being processed according to the passports they present. If they present a Canadian passport, they will be treated as Canadians, regardless of whether they have been born in one of the seven affected countries. LPRs were originally included in the travel ban but on January 29th the Department of Homeland Security issued guidance that deemed the entry of LPR to be in the national interest, qualifying them for the exception to the ban, as long as there was no derogatory information that indicated they were a threat to national security. Entry of Iraqis with Special Immigrant Visas is considered to be in the national interest. Iraqis can also continue to apply for Special Immigrant Visas. The executive order suspended all refugee admissions for 120 days and suspended refugees from Syria indefinitely. While the suspension of all refugees exempted refugees that were in transit, it did not exempt refugees from the seven affected countries that were in transit. Returning refugees and asylees were also included in the ban if they were from one of the seven countries. Family members following to join would be evaluated on a case by case basis.